Need to buy a gift? Sale prices on gifts for hard to buy people. Buy gifts for men, collectors, or anyone who 'has everything:' our gift store has unique items that will pique the interest of anyone on your shopping list. Classic Pez dispenser with Piglet head top and 2 packs of candy. 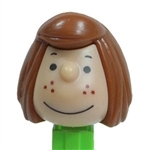 Classic collectible Pez dispenser with Peanuts' Peppermint Patty head top and 2 packs of candy. 30 inch silver link chain. Very strong with clip link. Prehistoric Shark Tooth from Morocco. Authentic Paleocene era tooth. Great for educational and tactile learning. Very cool! Flip open the cover to reveal a scene from the 100 acre woods. Inside sliding side drawer are magnetized character pieces: Pooh with wagon, Piglet, Tigger, Eyore, Rabbit and even a honey pot for Pooh! Create a new and exciting story each time you open the pages. Oh dear! Piglet and Pooh are twirling around and around inside their umbrella. Push the handle up and down to make them spin. Ages 6 and up.